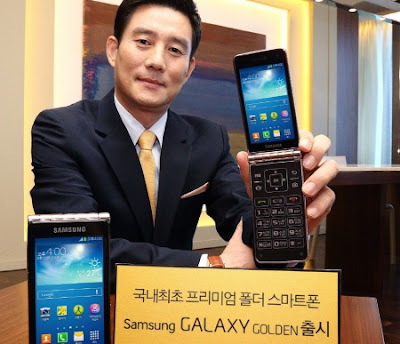 Samsung has announced their upcoming flip phone Samsung Galaxy Golden. The smartphone is chipped with dual-core 1.7 GHz processor,There's still no word on the internal memory or RAM. It runs on the Android Jelly Bean version 4.2 OS.Both screens of Samsung Galaxy Golden are 3.7-inch Super-AMOLED screens.The smartphone comes with 8 megapixel rear camera. Samsung Galaxy Golden is clearly a luxury phone and comes in champagne colour.The smartphone also comes with a business card reader.Samsung Galaxy Golden is priced at $700. You have to for some more time to get the full Features and Specifications of Samsung Galaxy Golden.